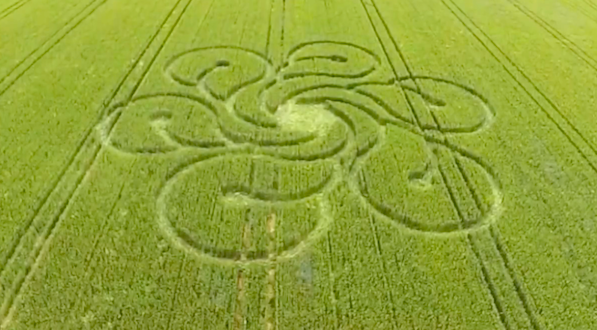 UFO SIGHTINGS DAILY: Crop Circle Found On Berlin, Germany Farm, June 12, 2016, Video, UFO Sighting News. Crop Circle Found On Berlin, Germany Farm, June 12, 2016, Video, UFO Sighting News. This is a fascinating crop formation. It has a flower or question mark appearance to it. It may have hidden symbols to it, but its hard to make out for sure. Today crop formations are both made by hoaxers and by aliens. Ever since the popularity in the 1990s, people noticed that all the attention was cool, and that they too could make such things. But don't be misled...aliens were the ones who started it all, but humans are making a mockery of it by trying to fool their own species. Crop formations have been recorded going way back in history. Farmers have reported finding strange circles in their fields for centuries. The earliest mention of a crop circle dates back to the 1500s. A 17th century English woodcut shows a devilish creature making a crop circle. People who lived in the area called the creature the "mowing devil." In an 1880 issue of the journal Nature, amateur scientist John Rand Capron reported on a formation near Guildford, Surrey, in the south of England. He described his finding as "a field of standing wheat considerably knocked about, not as an entirety, but in patches forming, as viewed from a distance, circular spots." He went on to say, "... I could not trace locally any circumstances accounting for the peculiar forms of the patches in the field ... They were suggestive to me of some cyclonic wind action..."
Mentions of crop circles were sporadic until the 20th century, when circles began appearing in the 1960s and '70s in England and the United States. But the phenomenon didn't gain attention until 1980, when a farmer in Wiltshire county, England, discovered three circles, about 60 feet (18 meters) across each, in his oat crops. UFO researchers and media descended on the farm, and the world first began to learn about crop circles. By the 1990s...crop circles had become something of a tourist attraction. In 1990 alone, more than 500 circles emerged in Europe. Within the next few years, there were thousands. Visitors came from around the world to see them. Some farmers even charged admission to their mysterious attractions.